Building electronic compass using HMC6343 gives lot of advantages like Heading / Tilt output, 3-axis MR Sensors, Accelerometers and a Microprocessor in a Single Package and gives A complete compass solution including compass firmware. You can find basic HMC6343 Arduino Interface and code in this article. The HMC6343 Three-axis Compass with Algorithms module from honeywell is a fully integrated compass module. It can handle magnetic distortion also with better calibration. This module comes in LCC ( Leadless Chip Carrier ) package and its better to play with Breakout board, here we taken HMC6343 Breakout board from sparkfun for prototype. 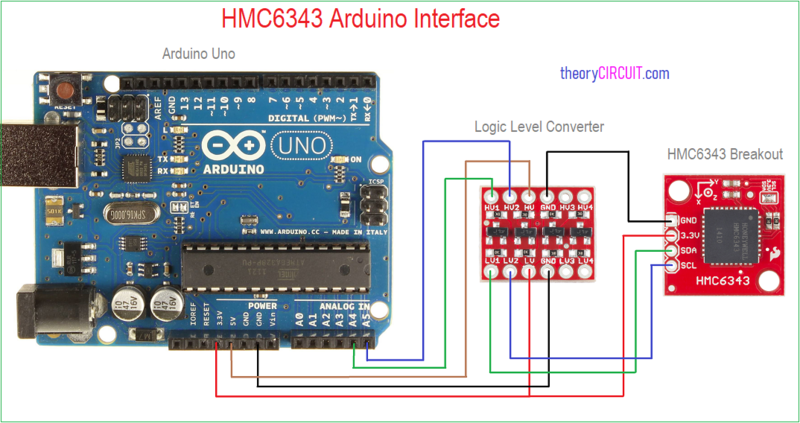 The Sensor HMC6343 works in 3.3 Volt Logic level and the Arduino UNO works in 5 Volt Logic level hence we need a Logic Level Converter Here so the Arduino UNO board and HMC6343 Breakout board Interfaced through bi-directional logic lever converter board. After completing the Hookup upload the following Arduino Code and obtain the Compass output at serial monitor. To connect this HMC6343 breakout board with Arduino board we need Library and you can get it here. You can find basic and advanced example arduino code for HMC6343 in Library file.